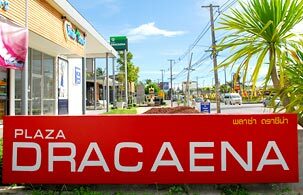 Plaza Dracaena is a one stop shopping mall for satisfy all needs. Located in charming point, Chalong Circle opposite the new HomePro and close to Nai Harn Beach, Promthep Cape. The complex includes 34 shophouses and has 2 zones for business offices and commercial. Over four rai with covering 1,852 square meters plus two more rai parking lot, 500 cars capacity. We are also available for long-term rent with reasonable rental and professional services. Providing the best alternative to make your business get more profits.